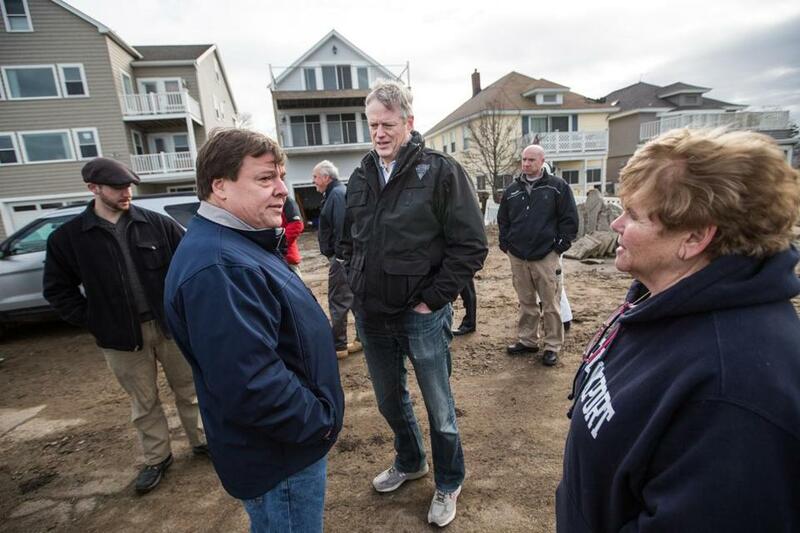 Governor Charlie Baker walked with Mayor Thomas Koch along Post Island Road in Quincy that was heavily damaged by flooding from the recent storm. Governor Charlie Baker said Monday that he “absolutely” expects to ask the federal government for disaster aid for the Nor’easter that walloped Massachusetts last week, flooding several cities and towns, and leaving almost 50,000 customers without power as of Monday afternoon. If President Trump declares the storm a major disaster for Massachusetts, state and local governments, and certain private nonprofit organizations, like hospitals, would be able to have 75 percent of their eligible storms costs reimbursed. Those might include public safety workers’ overtime, repairing public buildings, roads, ports, and other similar items. Depending on the scope of damage, the federal government could also offer assistance to individuals affected by the disaster. In late 2015, Baker announced a projected $120 million in federal reimbursements for state, city, town, and nonprofit costs for the early 2015 monster snowstorm that thumped Massachusetts.